Caroline, in her own words. earning an Associate of Science in Nursing and a Bachelor of Arts. Caroline’s art continued, working with oil pastels and watercolors. Workshops in which she has participated since moving to Atlanta include Colored Pencil with Carol Sutherland and Watercolor with Rose Mary Steiffle at the Atlanta Botanical Gardens, Oil Pastels with Carly Clements and Figure Painting with Charles Scoggins. She also attended workshops by Florida artists Roscoe Wallace and the late Gale Bennett. In June 2001, she arranged for a private painting lesson in Monet's Garden in Giverny, France with Gale Bennett, Founding Director of ArtStudy-Giverny. This experience truly changed the direction of her life. She returned to ArtStudy for an 11 day session in September of that same year. Due to the tragic events of “9-11", she was unable to return to the United States as planned and continued painting in Monet's Garden and completing a total of 43 paintings! In 2002, she returned to ArtStudy Giverny as an assistant to Mr. Bennett and returned each successive summer. When Mr. Bennett died in March 2008, she became the Resident Manager of ArtStudy and returned in 2009 to manage the final sessions of ArtStudy-Giverny. 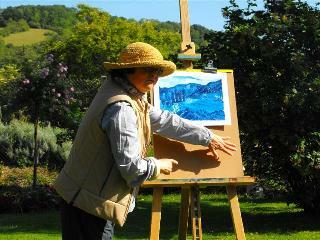 Caroline has taught private students and workshops in West Virginia, Virginia, Florida, New York, Georgia and Giverny, France. She was chosen by Mr. Bennett to teach his session at ArtStudy in 2008 and has the honor of carrying his legacy of teaching Gale Bennett’s "Observation with Imagination". This method emphasizes observation and creativity, utilizing warm and cool colors, and brush stroke and composition techniques developed during the Impressionist movement. Caroline’s paintings are in private and corporate collections in the United States, Canada, Germany and France.